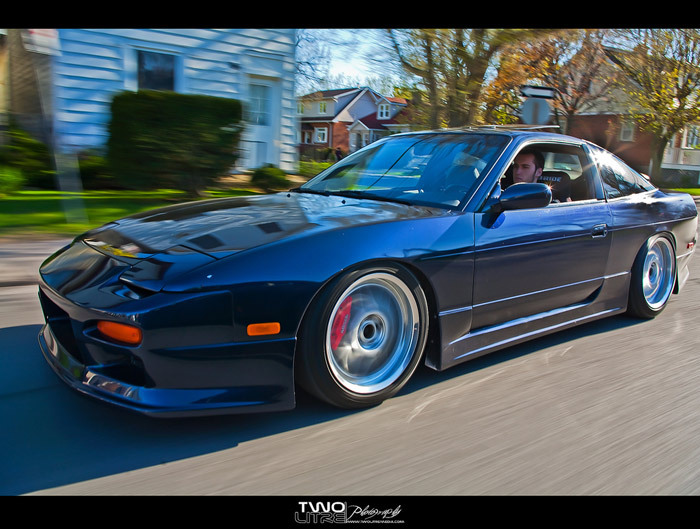 This is probably the cleanest 240sx I have posted in a long, long time. While I’ve got nothing against cars that get used on the track and wear their battle scars with pride its also always nice to see a car that’s super clean with no panel damage or zip ties keeping the body pieces on. This one was shot my Emilio at TWOLITREmedia and as soon as I saw the set I asked permission to re-post them because I love both the photos and the car. Might be the cleanest Nissan I have posted since this one. is it me or does that front bumper look abit IROK’ish lol but all jokes aside tiz 1 squeeky clean sx! Wow that 240 looks good, anybody know the specs on the wheels and tires? I would love mine to turn out that perfect!?!?! I don’t but I can ask the photographer to ask the owner. I would definetly appreciate that, this car is just amazing.